Now that the 2012 Cotopaxi program is complete, we’ve collected all the action including videos and photos from the last year right here. Who are these people? Learn about the team. First time visitor? Learn about this program and what we’re all about. This program would not happen without the generous support of sponsors and individuals. While in Ecuador our nimble media crew shot, edited, and published these videos on the fly. Prior to the team’s departure for Ecuador we met twice in Colorado to train. I am so very happy and proud of each and every one of you. I have been closely following your whole journey and it does my heart good to know BOTH that some of you made it, and some of you didn’t. Let me explain why. The guides have probably shared with you all the technical reasons for turning around. Not even being there I know I would agree. After a storm cycle like that, and winds like you had, followed by high temperatures, the avalanche potential is usually huge. You know the story, “ If I had a nickel for everytime I have had to turn around on that hill, I would have lots of nickels”. Having grown up with Rene and other Ecuadorian guides on your trip, I trust their judgment was sound. I would however like to offer a different approach, one that you can sadly find on the internet today. Today a hero of mine died; Maurice Herzog. Any of you that have researched the history of mountaineering know the name. If you don’t, allow me to share. Maurice along with two close friends climbed the first 8,000M (26,000ft) mountain ever climbed by humans, Annapurna in 1950. This was three years before Everest was first climbed. He lived a full life and died today at 93 years old. He and his two summit partners had an epic descent, which ended in all of them losing most of their fingers and toes to frostbite. He, much like all of you at that point after returning from war, had a choice; lay down and take it, or find a way to move on. Maurice wrote a book when he came back, telling large tales about the adventure just GETTING to the peak, the climb, and the aftermath as doctors slowly cut off much of his hands and feet. He ended this book (Conquistadors of the Useless) and his story with a very simple sentence, which I think applies whether you are a man or woman; “There are other Annapurna’s in the lives of men”. After writing the book he went on to become Minister of Youth and Sport in France, as well as the Mayor of Chamonix, France. All this from a simple farmer. When I reflect on how much of an influence he was on me growing up, the older I get, the more I understand that last sentence. To me it means summit or not, there are other things, other things we can’t see yet, can’t understand; but the journey towards these things teaches us how to keep putting one foot in front of the other. When asked if the summit was worth his hands and feet, he always had the same answer; “No”. He would then go on to explain that losing his hands and feet became important when he started educating youth in climbing, then educating politicians while he was Mayor. He said, only then did the lessons apply because the “days in the valley doing these things were much harder and more complicated than the days on the high slopes”. So I would offer in closing that thought. Whatever you went thru on Cotopaxi will serve you well, summit or not. Don’t let this one event define you. Let it offer a place to start from, which as always, is the greatest hope of Soldiers To Summits. Come visit me anytime. My door is always open. I’ll never forget how excited I was 10 months ago when I received the email from Charley Mace congratulating me for being accepted to be one of the members of the 2012 Cotopaxi Team. The correspondent told me of their mission to help me reclaim my life. It promised me new tools to innovate through barriers, build strong support systems and strengthen my approach to adversity. It offered me the opportunity to serve and lead others. The email informed me that by putting me through a rigorous transformational journey, they hoped I’d learn life skills to help achieve my dreams and become a “No Barriers” leader. And while all that sounded wonderful, I doubt that I’m alone in saying what excited me most was the opportunity to travel to South America and experience the adrenaline rush that accompanies scaling a 19,000 foot mountain in Ecuador! Over the course of the following months myself and the other participants had multiple training sessions, where we built team cohesion and learned the basics of mountaineering. While every one of these assemblies was an adventure and accomplishment in and of itself, my inner monologue still impatiently droned, “Can we please climb an Andean Peak already? !” Well yesterday my voracious spirit was finally appeased. After months of training, expectancy and excitement, The 2012 Soldiers to Summits Team at long last climbed our first mountain here in beautiful, sunny Ecuador! The journey up Guagua Pichincha, a 15,500 ft active stratovolcano, was every bit as fulfilling as I could have hoped. Gratifying is a gross understatement for the experience of finally banding together with this group to put all our training and preparation to use. The feeling of adventure was undeniable as we trekked in the cool morning air through the foreign landscape to the Lloa Refuge at the base of the mountain, where we would begin our ascent up to the summit of this colossal peak. While the ventures up James Peak and Mount Sherman in Colorado, during our training sessions were fun, they mainly consisted of… well.. basically just walking. The appeal and allure of Soldiers to Summits was that they boasted “Mountain CLIMBING” not “Mountain WALKING,” and that’s what made yesterday so exciting. In addition to the hiking required to reach the top, it was also essential to perform more challenging actions, calling upon our athletic ability and technical knowledge to maintain safety. We had to scale jagged rock faces. We traversed ledges with hundreds of feet of exposure at our backs. We were belayed over cliff ledges. The whole day was one adventure after another culminating in a scramble up hardened lava to the crater rim of the active volcano. Indiana Jones eat your heart out! The experience was amazing, unforgettable and only the beginning. As incredible as the climb was, it was merely a precursor of the challenges to come. We still have over a week in this exotic land, miles and miles to hike, obstacles to confront and… oh yeah… one HUGE mountain to climb. With everyday bring us closer to the 19,347 ft peak of Cotopaxi, the team’s excitement continues to rise, our friendships continue to solidify, and this journey continues to present personal accomplishments and rewards that will be remembered for the rest of our lives. And oh yeah… I’m learning life skills to help achieve my dreams and become a “No Barriers” leader. We have arrived In Quito! What a journey. After about a year of curriculum development, participant selection, training sessions in breathtaking Colorado, WE HAVE ARRIVED! Travel to Quito was a bit of an adventure in and of itself. The airline was less than helpful with our numerous overweight bags as well as having a couple of hour delay in our travel. In No Barriers fashion we plowed through as a team and all of us along with our baggage arrived in Quito around 10pm Saturday night. It did not take long for us to realize that we were no longer in the United States. We arrived during Fiestas de Quito (Founders Day, Quito). This festival features parades, street dancing, Chives (open air party buses), and bull fights. The streets of Quito were alive and bustling. As will celebrations like this we also witnessed our share of nefarious activities. The area we are staying in appears to have its fair share of crime. It is always striking to me as I have traveled to other countries the similarities and differences between the United States and the country I am visiting. People are people no matter where they live. (Isn’t there a song about that or something?) The good and bad parts of our humanity crosses boarders and cultures. There are a lot of conveniences for a traveler from the United States here in Ecuador. First, they use the US dollar as currency. Paper money is exactly the same here, however, their coins can be confusing. They have an amalgamation of US and Ecuadorian coins. One might receive three nickels back in change that would all be struck differently even though they are minted in the US. It can be confusing. It also appears that unlike the US, Ecuador has the common sense to do away with the paper one dollar bill. Their coins are similar to ours. The one I currently have possession of looks like any Sacagawea dollar one could obtain in the US on the face of the coin. The back is very different. I am really interested to see if I can use one of these coins back in the US. I wonder if anyone will notice. They also use a .50 cent piece which I LOVE! Electricity delivery is the same in Ecuador as it is in the US. No adapters or special plugs needed! For those of you who have traveled from the US you know that is HUGE! The program is progressing well in our first few days here. We had a very successful classroom day yesterday. One of the lessons was discussing our fears. I was truly surprised that most of the collective group fears landed in 5 or 6 categories. We all share the same fears. As that discussion fleshed itself out, I felt a common bond with the group. It is nice knowing that despite having different military experiences, different cultural experience, and living in very different parts of the United States we are really not that different from each other. Transformative programs like Soldiers to Summits change lives. That is our mission to help veterans overcome barriers and reclaim their lives. Having said that, transformative programs like Soldiers to Summits cost a lot of money. I want to thank two of the MANY sponsors of this program: Kevin and Linda Noe and Polartec for your generous support of this program. This doesn’t happen without you and I can not say thanks enough for extending your resources to Soldiers to Summits. Please help us raise $1 for every foot climbed on this expedition so that we can continue to transform lives with future S2S programs. Every dollar helps the cause! Support the Dollar for Every Step Campaign here! October 6, COLORADO – The No Barriers team is proud to announce that Soldiers to the Summit (S2S) is now an integral part of our mission to promote cutting-edge ideas, approaches, and assistive technologies that help people with challenges push through personal barriers. Operating under the umbrella of No Barriers, S2S will reach out to our nation’s heroes who are facing significant injuries and arduous recoveries. Soldiers to the Summit (S2S) is an ongoing program, ending with an exciting capstone expedition, to specifically assist veterans dealing with post-war challenges. The S2S program strengthens the rehabilitation process and helps veterans prepare for their future. A mentoring component of the S2S experience builds upon the camaraderie and support-systems which are often integral to a veteran’s military experience. Soldiers to the Summit began last year when Erik Weihenmayer (our co-founder and Chairman of the Board) and his team celebrated the tenth anniversary of their historic Everest climb. Together they led eleven disabled soldiers, all injured in Iraq and Afghanistan, toward the summit of Lobuche, a 20,161-foot peak in Nepal. This expedition was a tremendous success and will soon become the subject of a major feature film that will highlight the challenges faced by our veterans as they work to return home after life-changing injuries. No Barriers has played an increasingly important role in raising funds and creating awareness for Soldiers to the Summit. We have extended that legacy forward with our successful fundraising climb of Quandary Peak in May and the inclusion of the Lobuche team members at our No Barriers Summit in July. We are also pleased to announce that Charley Mace will serve as the Program Director for the S2S expeditions. Charley was with Erik on Everest and was an integral part of the first S2S expedition to Lobuche. He is one of Americas most highly regarded mountaineers with years of experience as a professional guide across the great ranges of the world. Charley has guided on every continent, climbed the seven continental high points, and summited four of the world’s fourteen 8000-meter peaks. In addition to his climbing talents, Charley has a very strong business background. For six years, he was the Chief Operating Officer of Trango Equipment, a premier climbing equipment and apparel business, and he is a former Director of Operations of the American Alpine Club. If you would like to help support or become more involved with the Soldiers to the Summit, you can contact Charley directly by email at cm@soldierstothesummit.org or phone at 303-888-7247. Sherpas – Who Are They? I always thought Sherpas were amazing mountaineering athletes. After experiencing their culture and presence it is evident they are devoted to their immediate and extended families. They have beautiful children and homeland. They share it all with us as they devote their climbing lives to helping others summit their goals and dreams. Kami Tenzing Sherpa – Kami was our Nepalese expedition leader. Kami guided us with a firm determination and a gentle, caring manner. He assembled an efficient and always helpful team for the trek and the best climbing Sherpa team we could have imagined. We owe Kami and all his team our special thanks for contributing so much to our success and memories. Chhemeng Nima Sherpa – Chhemeng was our climbing lead on Lobouche and one of the world’s great climbers. He had summited Everest 19 times. “ Tragically, Chemeng was killed in an Avalanche on Baruntse the week following our expedition. Chemeng, thank you for helping the soldiers summit their goals and our prayers are with you. Ike Isaacson. Photo by Didrik Johnck. October 20 KATHMANDU – Outward Bound’s Luis Benitez talks to Didrik Johnck in this video clip shot back up in the Khumbu Valley about the Soldiers to the Summit team and the end of their hero’s journey. Luis Benitez leading a small group up fixed lines. Photo by Didrik Johnck. October 19 LUKLA, NEPAL – At Outward Bound we tell everyone that participates in our programs that “there is more in you than you know.” I used to think this phrase summed up the efforts and goals of OB as an organization pretty succinctly. After working with these Soldiers on this amazing expedition, my perceptions have shifted to a whole new level. Outward Bound’s history with the military dates back to the Vietnam era, serving returning veterans through five-day mountaineering programs out of our base camp in Leadville, Colorado that utilizes the same course area that the 10th Mountain Division employed to train Soldiers before their deployment to Europe during World War II. These programs were designed on the same premise as most OB courses, take a group of strangers, place them in an intense environment to undertake exceptional challenges, and shape the outcomes to assure lessons learned are taken back home to help make everyday life more extraordinary. It’s one thing to facilitate this process in Colorado, but to take a group of Soldiers where some have been literally blown up, shot at, and torn apart and take them to the Himalaya to climb a peak was a daunting prospect. However once Erik, Jeff and I started talking about Outward Bound’s part in this, we realized that thru OB’s history with serving veterans we could do more, and provide more to these Soldiers in an effort to continue their road to recovery. So on this expedition, we wanted to combine the prospect of climbing the mountain, with the tangible transference of what a true Outward Bound course would provide, giving the effort shape and definition. In working with Peter Baliey of The Prouty Project, The Heroes Journey started to take shape. To define this process, after each day’s journey, we came together as a team to talk about high/low points of the day, as well as talk about bigger topics like who were your “allies” back home? How do you define your “road of challenges” thru life? The analogy I used for this process was one of building a house. Some days you would build a few walls, perhaps put in a window or two. Some days saw a wall destroyed, or the “misuse” of “tools,” but the overall effort, if the work was quality, was of a structure that would stand the test of time. The upper part of Lobuche with a climbing team. Photo by Didrik Johnck. October 18 MONZO, NEPAL – Mountain climbing is an irrational pursuit. On our extraordinary summit day, I had the honor of climbing with Specialist Steve Baskis. His combat injuries left him completely blind and with limited use of his left hand, but with an admirable inner strength that will always serve him well. We left our high camp at 1:00 AM to clear skies and relatively warm air. We had experimented with a few techniques for climbing together on the trek in including Steve holding on to the back of my pack for direction or following the sound of a bear bell, which is how we typically travel with Erik. We opted for the bell approach with me in front of Steve and Jeff Evans following to provide adjustments and corrections in the event of difficult trail, which was most of the time. I can’t claim to know what Steve was thinking as we left the safety of our camp, but he did begin to express a series of concerns that revealed his mindset. “I think I’m going too slow”, “I don’t think I trained hard enough” and “I don’t think my gloves are right” were some of his comments. I view my role in this process as to lend encouragement from my skills and experiences. While these soldiers have been through a wide range of extreme experiences, summit day on a Himalayan mountain has unique parameters and pressures. When the opportunity came for me to help with this incredible journey, I was grateful for the chance for to show my appreciation for all that these heroes had done for me. There was also a serious responsibility to get these amazing people home safely. Steve got married in January. Based on our lengthy trail conversations, his bride, Sarah, has many admirable qualities and his love for her is unquestionable. My encouragement of this mountaineering effort was easy because I knew Steve was strong and his questions were rational. Some of the soldiers had already turned around, so it seemed even more important to Jeff and me to have Steve summit as he embodies the incredible spirit of this expedition. It was a long and arduous climb, but as the day unfolded, Steve’s indomitable attitude prevailed. He was actually the third person to summit! We had great views, the weather cooperated and we got everyone down safely. I am grateful that our encouragement in the form of not accepting Steve’s attempts to turn around worked out well. We achieved success on many levels. I am most grateful that I could leverage my knowledge to bring some benefit to these incredible soldiers’ mountain experience. Steve Baskis taking a rest. Jeff Evans and Sherman Bull rest in the background. Photo by Didrik Johnck. Erik Weihenmayer minutes below the summit of Lobuche. Photo by Didrik Johnck. October 15 PHERICHE (This post was held up @12 hours due to an Asia-wide satellite outage) – What a day! I almost don’t know where to begin this was such an exciting day. After trekking for 10 days we finally approached our summit day with excitement. It was really hard to get any sleep before making our climb. I was extremely restless. We left in two groups one at 1 am the other at 3 am. The plan was to meet on the summit together. When group one left I was already up and ready to go despite leaving in group two. The first part of the climb was a rock scramble up really slabby rock. There was lots of loose rock and scree also. Toward the top of the rocks we could see the massive snow slopes above us as the sun began to rise. We were also greeted by the massive giant mountains of Nepal. I have been in the mountains in Colorado and Alaska and I can assure you nothing compares to the scale of these beautiful rugged giants. NOTHING! We quickly strapped on our crampons and began our ascent. It was as hard as you think it would be. I have climbed a lot of mountains but never at this altitude. It is a real fight to survive the altitude, save the climbing. I was blown away at the resolve I saw on everyone’s face as they pushed themselves physically, mentally, and emotionally. I remember conversations along the trail as we began to push each other knowing that everyone on our ropes had what it took to summit. As I hit the summit I broke down in tears. Charley Mace had to dry my eyes as I was overcome with a sense of accomplishment and pride. I had reached my personal elevation high at 20,075 feet. It is hard to describe my complete mental process but I was overwhelmed with emotion. Then I looked up. There is nothing like looking across the skyline and seeing nothing but huge, giant mountains for as far as the eye can see. There are absolutely no words to describe the scale and size of these mountains. NO WORDS. We looked across the valley and saw the highest mountain in the world; a short 8 miles that might as well have been 100. The scale is that big. No photo will do it justice. Our team met on the summit and it was a very emotional experience for all involved. It was a real coming together showing what a few individuals could do if they decided to do it, disability or not. Knowing that getting to the top was only half way we spent a short 45 minutes on the summit and began our descent. With a couple of exceptions we all arrived at our advanced base camp unscathed. I know over the next few days/weeks I will have a lot more to say about the day and what we experienced but honestly I am not sure I have processed all of it yet. I would like to thank sponsors again for getting us here. For me in particular I would like to thank United Airlines, Bent Gate Mountaineering, Quaker and World T.E.A.M Sports. We have a few more days of trekking to get down completely and I will talk to all of you again soon! Matt Nyman on the summit of Lobuche. Photo by Didrik Johnck. Dan Sidles on summit of Lobuche. Photo by Didrik Johnck. 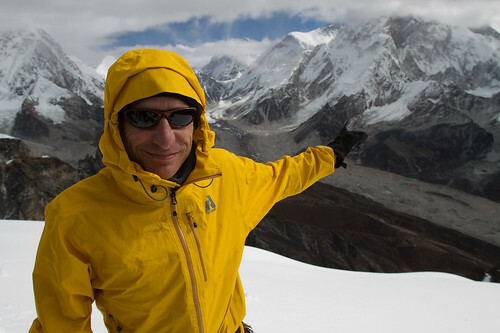 October 15, 2010 LOBUCHE HIGH CAMP – Decision was made to divide the group into two teams to synchronize summit times relative to climbing speeds. The mountain is divided into two distinct sections. The first half is rock slabs while the second half is steep snow and ice. 12am – wakeup call for Team A. Rizzo is not feeling well and decides not to climb. Cody stays behind to support Rizzo. 1:15am – Team A departs high camp (17,000 feet). Ashley is not feeling well and turns around shortly after departure. 2am – Team B wakeup call. 3am – Team B departs high camp. 5am – Didrik, Erik, Kami reach snow line (18,200 feet). 5:30am – Rest of team A arrives at snow line. 5:45-6am – Snow line reached by Team B. 8am – Teams merge at ice chute 400-500 feet below summit. 8:15 – Erik and Kami arrive summit (20,075 feet). 8:45 – Michael Brown arrives summit. 9-9:30 – Rest of team summits. 10:30 – 11am – Team begins staggered descent off summit. Noon – Team begins staggered arrival back at snow line. Sherpas and porters are waiting with hot drinks. After a rest, team begins staggered departure down the rock slabs. 12:30pm – Brad, Sherman, Jeff, Didrik, depart snow for rock slabs. Sherman is experiencing profound fatigue and is short-roped by Jeff and assisted by two Sherpas. 1:45 – Murray, Brown, Jukes, Rex are 1st climbers to arrive back at high camp. 2:30 – Nyman, who is being short-roped by Charley, shows signs of cerebral edema. Jeff begins radio calls to Kevin in high camp to prep treatment options. 4pm –Didrik, Jeff, Nyman, Morris, Mace are last climbers to arrive at base camp. Rest of day/night is spent eating, hydrating, sleeping and treating Nyman’s cerebral edema. Soldier Justin Moore – Justin joined the expedition after the Colorado snow and ice training in August. As such he was not adequately trained for the conditions that would be encountered on Lobuche. Justin instead climbed to the rocky, pinnacled summit of Kala Pattar at over 18,000 feet on the same day the other soldiers were on Lobuche. 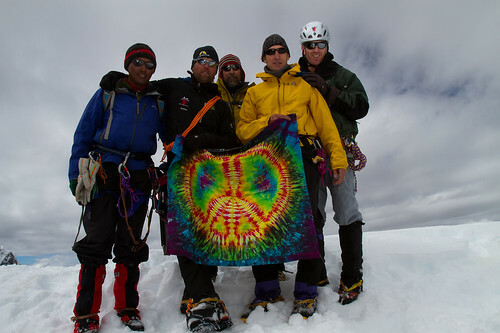 Climbing rock at over 18,000 feet is no easy task and the entire team salutes his accomplishment. The team cruising along the lower snowfields. Photo by Didrik Johnck. 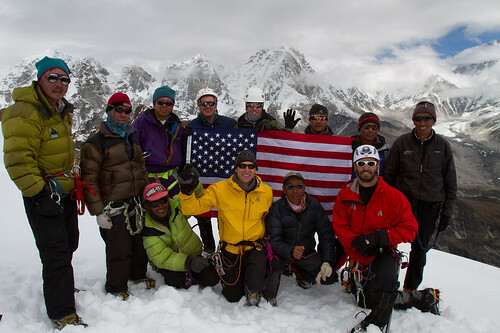 Soldiers to the Summit team photo on summit of Lobuche. Photo by Didrik Johnck. 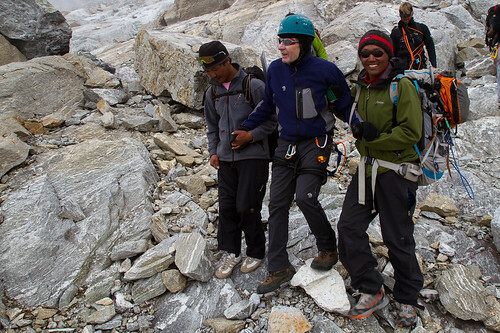 Outside Online published a nice blog post about the expedition and summiting Lobuche. October 13 PHERICHE, NEPAL – As we are about to separate to our two summit expeditions, I want to remind you that Lobuche and Everest Base Camp is not the goal. The goal is to demonstrate the courage and resilience of you, our injured soldier; and to encourage others who have been injured that they too can accomplish exceptional goals. We are very thankful to our ten Everest summit TEAMmates who have been instrumental in bringing the TEAM together. The 2001 Everest TEAM members offered to guide us so they too could give back to others in celebration of their successful Everest summit. They had hoped that just as they had benefited from a new level of confidence that transformed their lives, this expedition would do the same for the injured soldiers. We are deeply indebted to them for all of their tremendous personal and organizational support of the expedition. The mental and physical challenge of the Himalayan Mountains has inspired us. Tomorrow we split into two groups, one to summit Lobouche and one to summit Kala Patar and trek to Everest Base Camp. Our goal is to climb as high as safely possible and to descend safely. We are very proud that you have accepted this challenge and accomplished so much to be here in Pheriche at 14,130 feet. The last few days have been a transitional opportunity as you have crossed a huge threshold and the next few days will help you become the person you want to be. There will be many challenges as big as Everest and Lobuche in your future, such as career, family, community, or whatever it may be. You have sacrificed and given so much through your military service and injuries, we hope you will take this experience and lesson from this expedition and turn it into your Adversity Advantage. Ike guiding Steve through the rocks. Photo by Didrik Johnck. Scenes from the trail. Photo by Didrik Johnck. Oct 12 LOBUCHE HIGH CAMP – Here we are at Lobuche High Camp. This is the highest that I have ever been in my life! This is very exciting. I got to to sleep around 8pm last night and woke up around 2am. I’m a bit tired but very healthy and happy. The Zopkio that carry most of our gear kept me company last night while I watched the stars over the mountains. What an incredible place. We will be pressing to the summit around 2am which will make for a very busy night. Our only light will be from our headlamps as we push up the snowy summit. I expect us to summit the peak around 7am, exhausted yet having the time of my life. Thank you for all of the support and prayers. I hope to be sending out summit photos soon. Oct 11 LOBUCHE BASE CAMP – Outward Bound’s Luis Benitez takes us on a tour of Lobuche Base Camp as inhabited by Soldiers to the Summit Himalayan 2010 Expedition. Luis gives a shout out to sponsor Quaker for the oats and other eats and to the whole sherpa team for the good care they’re taking of the team. Well we have finally reached the tipping point. Today, after going up on the route with FINALLY improved weather, we returned to basecamp to make the decision that would point us in one direction or another. After observing the condtion of our route, rockfall, snow condtions, and knowing that teams on the Abruzzi Route just beside us have lost ENTIRE camps due to wind, we reached a conclusion. Wendell Berry, one of my favorite authors, said it best; “When going back makes sense, then you are going ahead”. The decision we have come to is just that. We have decided that given our timeline, the route conditions, and the forecast for yet MORE snow and wind, that this year is not our year for reaching the summit of K2. While making a decison like this is always hard, and we are very hopeful that our colleauges and friends that remain here will reach the summit, our margin for safety does not in all good consience allow us to push higher. 3 others on our team will be departing with us as well. I have told Katrina often that the mark of a seasoned mountaineer is being able to make decisions like this, and walk away with your head held high, understanding that by simply “showing up and giving it your all” that you have crossed a bridge that few dare to tread upon. As another favorite saying goes; ‘”Their are old mountaineers, and their are bold mountaineers, but their are no old, bold mountaineers”. We all plan to be old AND bold, hence the path we have chosen. This will be our last dispatch for this expedition, as the focus now will shift to the massive task of moving us and all our equipment down the valley. With weather potentially coming back in we are still undecided if we will go over a high pass to cut off a few days for the trek out, or if the weather does indeed roll back in, simply head back down the way we came up. Time will tell. We would deeply like to thank our sponsors, STS Capital Partners and Sherpa Adventure Gear, and I personally would like to thank Outward Bound USA for truly believing in the spirit of adventure and personal growth, regardless of the outcome. Till nextime, via con dios! So the time had come for the crew to split and say goodbye! The Broad Peaker’s headed out today, and we moved up to K2 basecamp where we have spent the day working hard to build platforms and setup camp. Yet another weather system has moved in bringing scattered snow and wind. Lets hope it gets better soon. The clock is ticking..
Todays efforts were not without reward. After a sleep at c2, we took a “walk” about 1/2way towards camp3, reaching 6600m or about 22,000ft. A perfect amount for our next round which will hopefully see us sleeping at c3 , about 400m higher then where we went today, and then being done with our time on Broad Peak. This year has proven to be a weather challenge, as some friends who tried for the summit last night found out. They were all turned back by thigh deep snow at about 7,900m. Some years here we are told, snow can shut everything down, even with good sun! Such is climbing life in Pakistan. more tomorrow hopefully from basecamp! We did it! The weather has been holding steady so after sleeping at c1 last night we made the move to c2 today, where we will be sleeping over 20,000ft. reports of more sugar snow up high will impact how high we “tag” tomorrow. we are hoping to go about 1/2way to c3 then zoom all the way back to base for a rest. 2-3 nights on the hill when you are acclimating is about as much as you should do per climbing cycle. more than that, unless you are on a summit push, you literally start to waste away! for now, we are all in good health and spirits! In climbing, sometimes you have those days, those days where you “walk the line” between turning tail and running down, and digging in and pushing forward. Today was one of those days. Our weather forecast we recieved last night was not a good one. A storm was on the way, a big one this time, that would effectively close down climbing on the mountain for a few days. After settling into Camp1 for the night, we deliberated what to do, and all agreed that if it started up overnight, we would be up at 1st light and head downhill. We woke up this morning to a light dusting of snow on the tent and a looming sky. As we all agreed it was worth it to “go up and take a look”, we headed out of camp with the intention of trying to “touch” camp2 at just over 20,000ft (6,000m). We knew that breaking that barrier would put us in good shape for the next cycle up the hill to then sleep at camp2 and continue getting used to the ever thinning air. The weather however, had other plans. First the winds came, then that transported what is called sugar snow. Imagine if you will a jar of sugar, now give that jar a tilt so the sugar inside sits at about a 45-55 degree angle, now imagine, at 18-20,000ft, in freezing winds, walking up that sugar. Thats exactly what we were faced with. Lapka, Katrina and I often talked about the ego associated with climbing. For myself being back with Outward Bound these past few years has showed me a different perspective on this. We always say, “challenge yourself, and change your world”. But I would add to that, there are times, days not unlike this one, where you have to become the animal that proper society tells you not to. You must in your heart believe you can do things that other people think are crazy, and you must believe you can do them well, for this is how you survive sometimes up here. Ego? Hardly. Simply a belief that you have more in you than you know. Despite the rolling waves of poor weather, we continued upward, with an eye towards avalanche danger, and by 11.15am we were at camp2. At this point a big thank you needs to go out to Fabrizio and our HAP’s (High Altitude Porters) for doing such an amazing job fixing line for the route. There are few people on this planet that can match these guys strength, and for that we are greatful. We rested, re fueled, and “hustled” back to camp1 and then to basecamp in time for a 2pm late lunch. Katrina is feeling strong, and we are all satisfied that this rotation up the hill went better than expected. So let the storm come! For now, we are content to be faced with a few rest days, and a newfound belief in whats possible. Todays rest day was filled with preparations for our hopeful move to camp1 tomorrow. Everyone stayed at basecamp today, not just the 2nd wave of climbers, due to bad weather all over the valley. Its been snowing most of the day, with hints of sun here and there. So like most families, what do you do when everyone is in town? Have a get together! Mike Horn, a Swiss, who has done more polar exploration than most folks dream about, and the list goes on and on. The stories and laughter went well into the afternoon, in multiple languages, fueled by various blends of “firewater” that most teams have brought with them. For the Spanish, wine, for the Slovak’s, some type of high grade rocket fuel, for the gringos like us, scotch all around! If the weather clears like it is supposed to we will be moving up to camp1 for a “overnight” tomorrow. We will keep you posted.